College of Military Engineering (College of Military Engineering), Pune Published Job Notification for 16 Electrical Engineering – Electronics & More Posts. Candidates who wish to apply must look at College of Military Engineering Recruitment 2017. Eligible candidates can apply offline before 24-06-2017 (24th June 2017). Education Qualification: First Class B.E / B.Tech in Electrical Engineering. For Post wise Education Details follow the detailed advertisement. 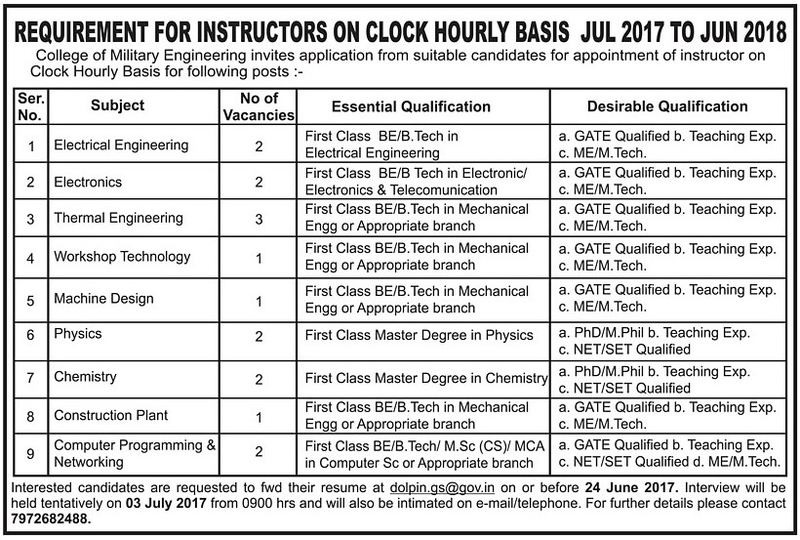 Interested & Eligible candidates can send their application along with all the necessary documents and testimonials mail to dolpin.gs@gov.in befour 24th June 2017. Starting Date, Last Date to Apply Offline at College of Military Engineering which candidates should be remember as follows. Start Date to Apply Offline: 13-06-2017. Last Date to Apply Offline: 24-06-2017.